Lloyd Gardner is Charles and Mary Beard Professor of History at Rutgers University. 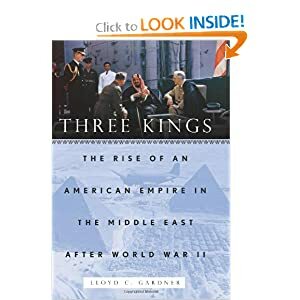 His latest book is "Three Kings: The Rise of an American Empire in the Middle East After World War II" (New Press, 2009). In 1929, Secretary of State Henry L. Stimson shut down an ongoing code-breaking operation saying, “Gentlemen do not read each other’s mail.” Stimson has come in for a great deal of flack from some historians for this action. A few go so far as to claim it was responsible for American unpreparedness leading up to Pearl Harbor. His was a Victorian outlook, they claim, sadly out of date after World War I and the revelations of the “secret diplomacy” between nations that produced a tangle of alliances and promises. To be willfully unaware of all the maneuverings as the postwar truce broke down and powerful evil forces emerged was like blinding oneself in a knife-fight. Pearl Harbor proved the point. But there is another way of reading Stimson’s reproach to the code breakers, however, that does have relevance to the hysteria over the most recent Wikileaks “treasure trove” of documents that pertain especially to historians. And it may be closer to what the long-time public servant really meant to convey with his statement. In the first place, his comment that gentlemen do not read each other’s mail ought to be treated by historians as a caution against making too much of gossip about foreign leaders. As we know, policymakers are supplied with short bios of visiting dignitaries to the White House, and the intelligence services provide biographies with psychological profiles for general use on the top floors of the State Department. But brief glimpses are hardly the stuff of serious policymaking. Second, Stimson’s comment refers as much to confidence in government as it does to reading other people’s mail. As American involvement in world affairs grew, the publication of diplomatic papers that began as an attachment to the president’s annual message lagged farther and father behind. Confidence in government remained high, however, despite the “revisionist” studies of American entrance into World War I and World War II. It was not until the Vietnam War that the “credibility gap” led newspapers to accept the responsibility for publishing the Pentagon Papers. After Gulf War I, President George H.W. Bush declared that the nation had kicked the Vietnam “syndrome.” What he meant was not simply achieving victory in that brief encounter, but the more important objective: recapture of public trust in government. He was as premature in declaring that particular “Mission Accomplished” as President George W. Bush would be in voicing his boastful assurance that the invasion of Iraq had been a monumental triumph and open the way to a new birth of freedom across the sands of the Middle East. Perhaps it cannot be asserted that Wikileaks’s greatest revelation is really about public disappointment with, or disapproval of, American foreign policy. Historians will need to examine the hysteria over the release of the documents, nevertheless, as a symptom of government concern about such mistrust and come to terms with that problem. Assange’s opposites in the Tea Party, particularly Rand Paul, share with him such a mission, if they do not wind up in the same camp about what to do. Daniel Ellsberg has long called for a new Pentagon Papers. One great difference, of course, between the Papersand the Wikileaks documents are the commentaries. The original Pentagon Papers volumes included narratives by the historians who compiled the attached documents, the usual formula of many history texts. Wikileaks are raw material given out first to papers in Great Britain and Europe. And the approach each newspaper, the Guardian, Der Spiegel, and finally the New York Times (which obtained them as a leak of a leak) takes in framing the documents is different. The Pentagon Papershistorians were less interested in formulating current policy than in explaining the way the United States got into the terrible predicament in Vietnam. Julian Assange has asserted, however, that it is his goal to embarrass the United States government, and, presumably, to force a change in American foreign policy. He may succeed—but not in the way he hopes. Historians have already expressed fears to me that the way the documents are framed in the American press (the NYT and derivative stories), could well increase pressure on Washington to go along with those countries that want to carry out, or say they want to carry out, a military strike to cripple Iran’s nuclear programs. Of course what they mean is that they would like the United States to carry out an attack that would give them plausible deniability. We have known from some time from other “leaks,” that Israel is the exception and would attack Iran if given American aid and protection. What an irony it would be if Wikileaks unleashes a campaign like the “Yellow Press” before the War of 1898! Already there are charges from the Iranian government that Wikileaks is little more than a subset of American intelligence, releasing documents as it would launch an assault with military weapons in an effort to bring down the government in Tehran. The attacks on Iranian nuclear scientists at exactly the same time as the documents are leaked, says its leaders, offers the proof of this campaign. The fallout from the Wikileaks revelations may therefore depend much less on the documents themselves than how they are used to advance a particular objective. What is instructive is how quickly the documents can be fitted into such a use, and/or how quickly an objective can be formed around the documents that might have trouble being achieved otherwise. Historians will have to grapple with all these questions in ways that looking at “old” documents did not require. New York Times editor Bill Keller weighed the pros and cons of publishing the documents and finally concluded, “it would be presumptuous to conclude that Americans have no right to know what is being done in their name.” Historians will wish to concern themselves with the cultural preoccupations of the American public with Hollywood gossip about foreign leaders, and how that will spill over into policy from eavesdropping on other people’s mail. Secretary of State Hillary Clinton seemed in some ways to be updating Stimson when she claimed that releasing these exchanges “was not just an attack on America’s foreign-policy interests. It is an attack on the international community.” Exactly what is meant by that comment is not entirely clear. She suggests that the leaks will set nations against one another, but that assumes other nations are basically naïve about how American foreign policy works. She claims in the next breath that there will be no long lasting impact on relations with America’s allies. So one is forced back to the problem of the American people’s trust in its foreign policy, and her main worry is about what that will bring. Indeed. Wikileaks is a mixed blessing for historians. Julian Assange wanted to humiliate America and its democratic allies and ended up humiliating its real enemies, autocracies. Is is a small wonder Prof. Gardner worries about the consequences. I have not looked at the site or viewed any of the improperly disclosed (leaked) records. Any discussion of them derives from my reading my local newspaper (The Washington Post). "No job if you link to Wikileaks, warns Columbia"
In equating the truth with exposure truth becomes a thing revealed to us by a supposedly heroic individual in the corridors of powers or thieves and journalists and editors comply in the denigration of the meaning of truth. It becomes something we are handed by external forces who apparently are always pure of motive. It is not something we find out through critical study and investigation ourselves. We now view truth as a religious revelation rather than as the endpoint of thought, interrogation, questioning, analysis. It is only through actively engaging with the problems by gathering facts and objectively analyzing (as best we can) and organizing them that we can arrive at any truth worth its name. This is the process of investigation through which truth is uncovered and formulated. It is revealed by the critical act of discovering and thinking rather than by some mythical, external truth teller. Waiting for truth to be revealed is a fool’s errand – whether one is waiting for God or some sap in a suit in the Pentagon who one morning has a very belated pang of guilt about his role in the destruction of Iraq or Afghanistan. By resorting to minor gossip and tittle tattle we handicap the free exchange of opinion inside the government. Eugene Debs once said, I am not a Moses who will lead you out of the Wilderness and into the Promised Land and even if I was I would not. For if I could lead you out of the Wilderness, someone else could lead you back in. Since I'm home on vacation, I'll add "posted on personal time." As a fed, I've worked in the past (although not at present) in so toxic in an environment, I once was accused of doing private historical research on government time. Better to add the usual caveat, even if it mystifies those who don't understand us feds, than risk some mean spirited punitive action triggered by little more than holding a different view than mine. An article with a promising title which on reading fails to satisfy to the extent it might have. Dr. Gardner does make some interesting points, he just leaves out one thing. There’s nothing about the chilling effect. I’m a federal employee. I work in a job of such a nature that some of the records I create are classified under the Federal Records Act as permanent (historically valuable) records that one day will be transferred into the holdings of the National Archives and Records Administration (NARA). If those records somehow were leaked to HNN’s readers and other members of the public now, shortly after I write them, rather than made available to you as researchers after disclosure screening by federal archivists, it would have a chilling effect on the written record of my job. Some things that I now write in the knowledge that researchers won’t see them for years or decades I would take “off line” by discussing them orally with my colleagues, only. That’s because “it’s not about you,” as it pertains to historians, it’s about the ability of public servants to carry out their governmental missions. The surest way to cripple feds and hamper our effectiveness would be to leak our internal deliberations or disclose them prematurely. We are no different than you in your jobs. That’s not to say certain information shouldn’t be disclosed through proper channels in advance of it being made available to historians, within the constraints established by case law regarding privilege, etc. Obviously, formal oversight, certain investigations, and similar activities depend on access to data before it is transferred to NARA. What Dr. Gardner and Dr. Johnson both overlook is the fact that leaks can lead to people reverting to oral decision making in some areas. Or if they choose to put thoughts in writing, using what lawyers call “discoverable” language. (Russell Riley wrote about this a few years ago as it affects the White House.) Since diplomacy and formulation of foreign policy require some internal sharing of reliable information and candid assessments, the leaks probably will lead to strengthening the barriers around access to information. There are areas where reverting to oral exchanges is not possible or feasible. If up to now too many people had access to the information contained in the data dump, there’s a chance that the publication could lead to too few who need it to do their governmental jobs having access. So the reviewers responding now to President Obama, including my friend and former colleague, the NARA ISOO director, will have to get the balance right. Records professionals (which I once was before taking a job as historian) have understood for years that while laws govern the life cycle of records, people cannot be compelled to create deliberative records. Dr. Gardner mentions trust but trust is a two way street. Just as we calibrate our personal conversations, putting topics “on the table” or withdrawing them depending on how much we trust the colleague or friend or spouse or other family members with whom we are dealing, so too does the decision to write down information depend in part on trust. Just as no one in your family can order or compel your trust, you cannot compel my trust as a public employee. With so many members of the public acting in a self centered (“it’s all about me and what I want to know and see”) or toxic (“if you’re not like me, you are evil and a danger to America”) manner, some federal employees already face some barriers to trusting the record keeping culture. We feds are as human as you are. If you want us to do our jobs well, you have to support the same proper handling of our written records that you would want for your own at your employing organization.